So, you may have noticed the flowers this spring. They're popping up all over the place. 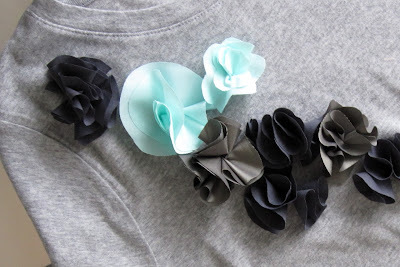 Fabric flowers on headbands and hair clips and ribbon belts and dresses ... and the t-shirts. Oh, the beautiful $45 t-shirts. You know the ones. Sigh. I'm not even usually a flowery type of girl, but even I have been seduced by the fabric flowers this season. So I started making some. 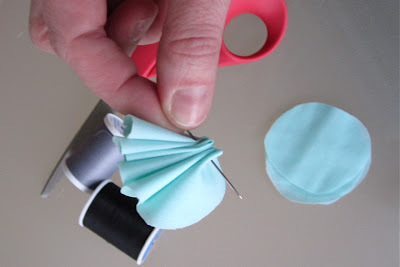 First, find some fabric scraps or swatches and cut out several circles. 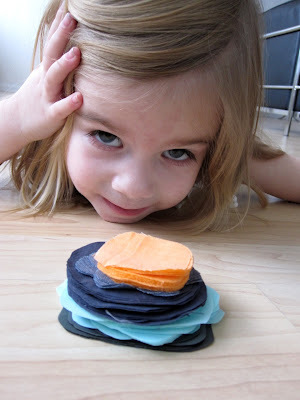 (Mine are about 2" in diameter, but you can make them whatever size you want.) 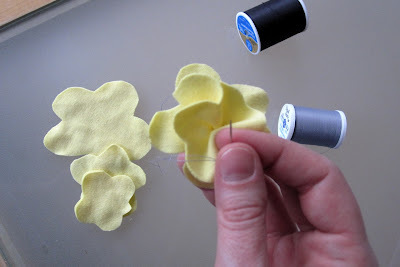 Then cut out some flowery shapes with petals – make some of them smaller, and some a little bit larger. I free-handed mine; they really don't need to be perfect. 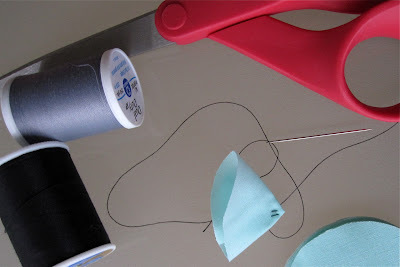 A note on fabric: I used all kinds of scraps that I already had in my fabric stash. Some fabrics will fray a bit on the edges, but that's okay. 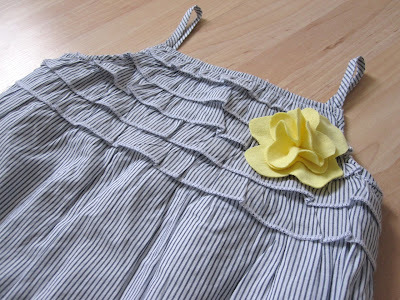 I used cotton, satin, organza, weird chiffon-y stuff and even some cotton jersey, which worked great. 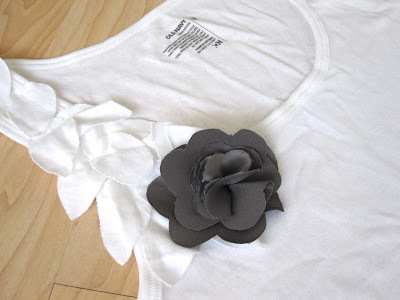 This could be the perfect way to re-purpose some old t-shirts that you don't know what else to do with. 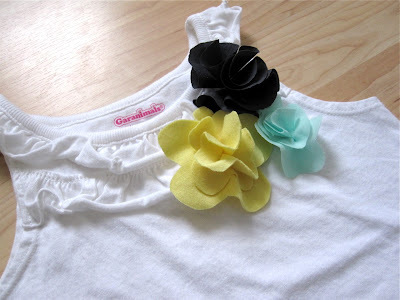 Grab your stack of flowery cut-outs with petals. 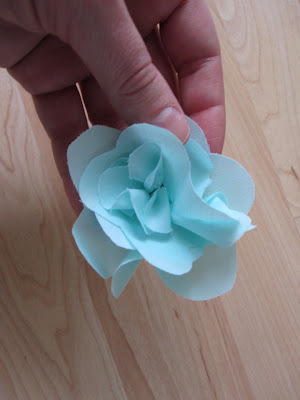 To make the flower's center, start by pinching one of your smaller flower shapes as shown – so it's in fourths. 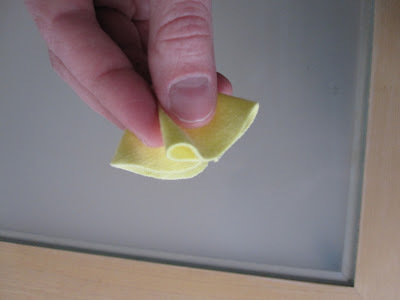 Make a few stitches in the very bottom of the pinched section, making sure to catch all of the folds that you pinched so it will stay gathered. Knot at the back. 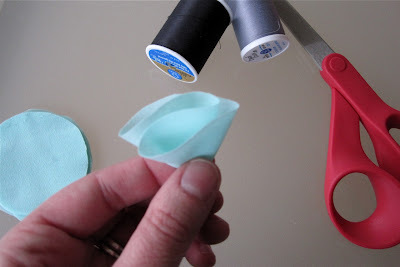 Add another similar sized flower cut-out behind it, and again, pinch the whole thing to gather it a bit. 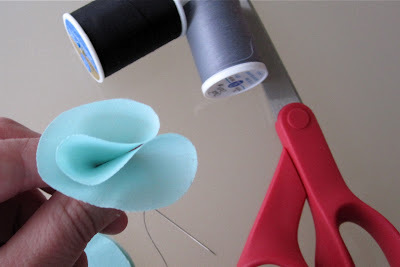 Sew through the back of the center of this flower at the base, where you pinched it. 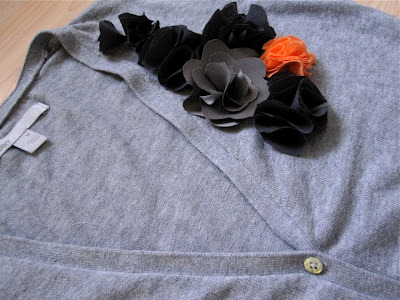 Stitch through all of the layers and continue to make folds/gathers to give it dimension. The back side will look something like this. You don't need tons of stitches to make this work; a few will do. 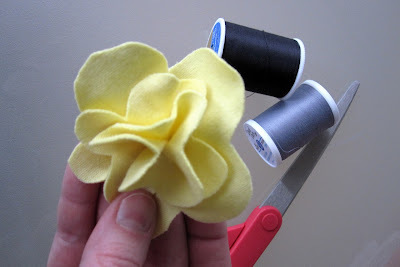 Then add another larger flower layer to the back, and another until you've achieved the size and shape you're going for. Ta-da! Just eyeball it as you go. You really can't mess it up. 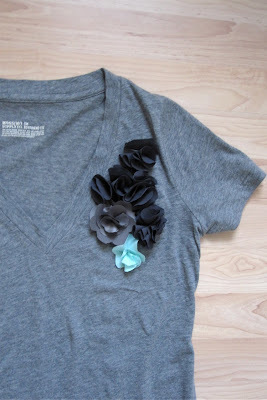 Here's another example of this type of flower, with more layers and in a lighter weight fabric. 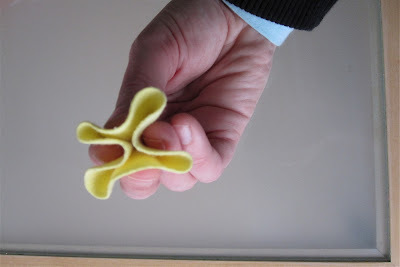 Stitch through the layers at the center point of your folds. Again, just a couple of secure stitches will do the job. 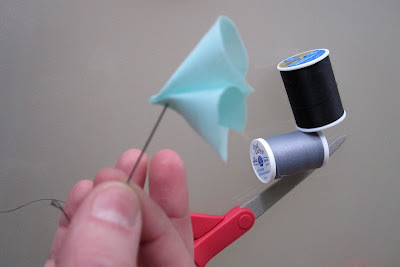 Then, fold several more of these little ruffles, stitch and knot their center points, and then line them all up on your needle. Squish them all together like this, and stitch through them all at once. I usually use around six to eight circles but you can use as many or as few as you want. 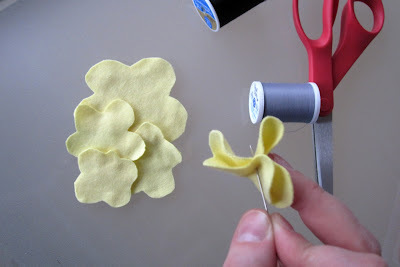 Tie a knot at the back and rearrange the individual ruffles/sections to make a round flowery shape. 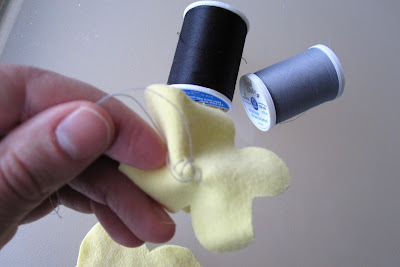 Make several stitches on the back to keep all of the layers in place. And you're done! Almost. And then I got excited about my closet. I could go on and on but you get the idea. Go forth and make pretty flowers. 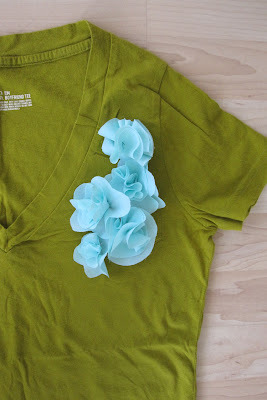 I love these fun, frilly flowers!!! Love, love, love this! Thanks so much for the tutorial!!!! I always want "those shirts" when i see them but can't pay that much. This is the perfect alternative! 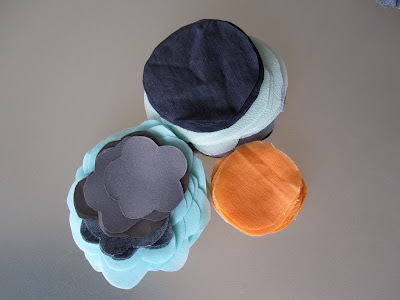 thanks for sharing jen - i've been saving and searching for fabric to make some, and handy that i can just use your tutorial now instead of searching online later! Awesome tutorial. Totally making some this week to send to my family out of the country. You KNOW I love these...will you be making more to sell? Please??? yay! thanks for the tutorial. I just found some white tee shirts i bought a while ago and havent worn (cos when I fine a style of white tee I like I will buy 5 of them) Now I know what to do with them! buddy! these are so cool! i'm def making some!!! fun!! 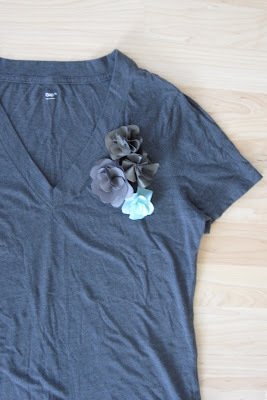 Love these, and I LOVE that white tank top one (ahem) and you could totally sell these at a craft show!! these are beautiful! Thanks for sharing the tutorial. Can't wait to try making some! cute cute! and thanks for the tutorial - very clear steps. Oh, lovely! I love them all - but the way the blue ones pop off of the green is just gorgeous. :) Rad! Love the shirts! I got several this year with flowers on them, because they are seriously on EVERYTHING IN SIGHT!! I love your tutorial, I don't watch video tuts, but I think photos are so much easier for some people! So way to go! Great Tutorial! 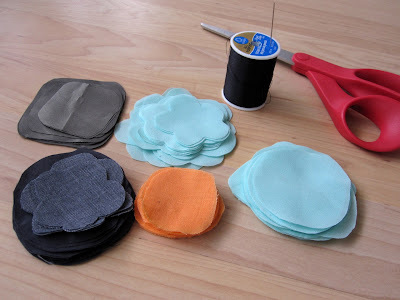 I will have to try some of these for cardmaking! I will be sharing your tutorial. I'm not into the flowers on a shirt trend, but I could see making a really pretty garland out of these to dress up my window for Spring. Thanks for posting such a detailed, well-photographed tutorial. Great photos and explanation. 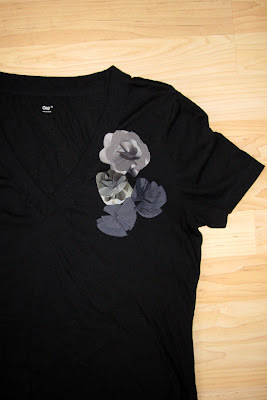 Inspired to bring some life back to my t's! Lovely! 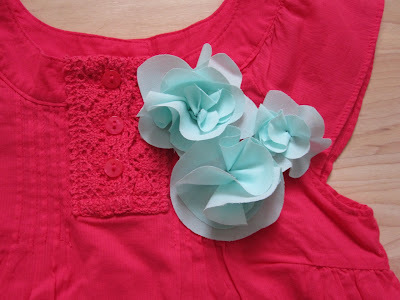 I just started a tumblr account called She Is Sew Creative to share all of the lovely, crafty ideas that inspire me. The link for this just went up there. Thank you so much. Love your blog! Thank you so much for sharing this! I can't wait to try some on my own! Very well done tutorial and good photographs. Thanks for sharing-- this is EXACTLY what I was looking for to make some birthday presents for my two younger sisters. I even bought the shirts beforehand, so confident that I would figure it out. Thanks for taking the guesswork out of it. Super cute! These are so cute! I especially love the blue ones! I think this tutorial is so great. I'll used it in my newest creations. Please visit my blog. I just shared this on my blog and linked it back to you. So cute! I'm going to put these on a bunch of clutches for a wedding. THANK YOU! 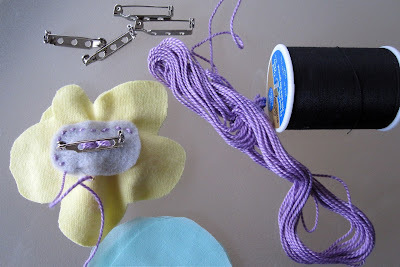 Wanted you to know I posted a link on my blog to this tutorial. how well do these hold up in the washer? Are you the one on ravelry who bought my excess twinkle yarn?? Here is the first of many things that I made with your wonderful tutorial! Here is a post I did on the other kind of flower. Thanks so much for kick starting a new passion!! 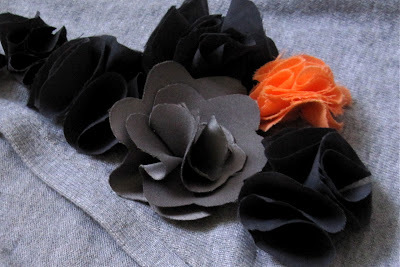 So excited to make flowers like this. THANKS !! Love your flowers! Here's a collection I found helpful as well. Hope you enjoy! Love the idea and you specifically explain every steps.. If you have more ideas, post it! 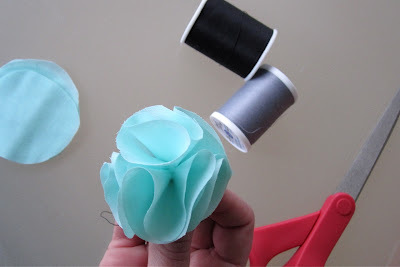 great idea.. i just going to make up some flowers to put on top of a wrapped gift.. cant wait..
this is one of the amazing post i like this a ,lot. Great flowers, thx for the tutorial. LOOOOOOVE your red embroidered top! Please, oh please tell me where you got it! Nice combos. Just found your flowers today. I am going to put them on everything. They are so beautiful. This is September of 2012. I am so happy they were still on here. 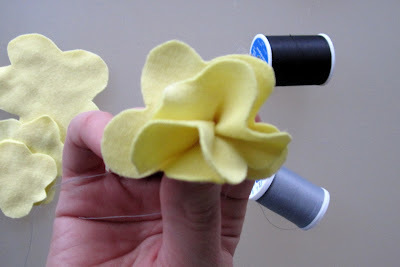 In tutorial II - when you them all up to sew the 5-8 little ruffles into a flower, do you have them so they are all folded in the same direction or alternating directions? Wasn't sure & couldn't tell from the pics! Thanks!! SO cute! 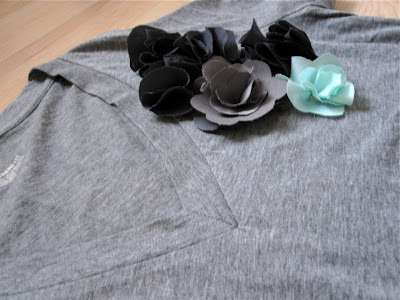 I love what you did with your shirt and have featured it in my post as one of ten ways to redesign t-shirts: http://thedomesticatedprincess.blogspot.com/2012/11/from-t-shirt-to-treasure-part-2.html. Yay!! flower power can I just hot glue safety pins on? their creative work. Health into the hands of the designer.